Organic September is a month-long campaign designed to raise the profile of organic in the UK and shine a light on the amazing organic farmers, producers and brands who work hard to produce food as it should be. But first, some questions . . .
What even is organic food? What determines whether a food is organic or not is how it is produced. Organic food production in the UK is currently bound by EU regulations, meaning that production cannot involve the use of artificial chemicals, hormones, antibiotics or genetically modified organisms. Organic produce is also free from artificial food additives including sweeteners, preservatives, colouring and flavouring. So organic is good for me? Many of the foods available in supermarkets today contain man made chemicals, fertilisers and pesticides. We currently know little about the effects these synthetic chemicals have on our bodies in the longer term. However, organic fruit and vegetables have been found to contain higher levels of antioxidants (up to 60% higher than non organic crops), which have previously been linked to a reduced risk of chronic diseases, including cardiovascular diseases, neurodegenerative diseases and certain cancers. And is organic good for the environment? Peter Melchett, Policy Director at the Social Association has explained the numerous benefits of organic produce on farming practices and the environment. Organic farming uses less fossil-fuel based fertilisers, and is the best available method for reducing green house gas emissions as it stores higher levels of carbon in the soil. Organic farms also attract more wildlife, providing a home for bees and butterflies to allow nature to thrive. Organic food has often had a bad rep in the past for being over priced and pretentious. However, dairy products such as milk, yoghurt and butter are an easy organic swap to make at very little price difference. Fruit and vegetables often doesn’t cost anymore than non-organic, especially when you buy in season, which also encourages more sustainable farming practices. I’m sure organic meat definitely is more expensive . . . Yes, organic meat is more expensive that its non-organic counterparts, it’s important to recognise that quality over quantity is important here. We should all be aiming to eat less meat, for our health and the environment. The money that you save eating more vegetables, lentils and pulses can be used to buy the best meat when you do decide to eat it. Organically reared animals have also led a longer healthier life, which surely means healthier tasting meat! What can I do to go organic? Strawberries, spinach, nectarines, apples, peaches, pears, cherries, grapes, celery, tomatoes, sweet peppers and potatoes. Sweet corn, avocados, pineapples, cabbage, onion, sweat peas, papaya, asparagus, mango, aubergine, honeydew melon, kiwi, cantaloupe, cauliflower and grapefruit. As a general rule of thumb, the thinner and more delicate the skin, the more likely it is to be affected by chemicals, pesticides and fertilisers. 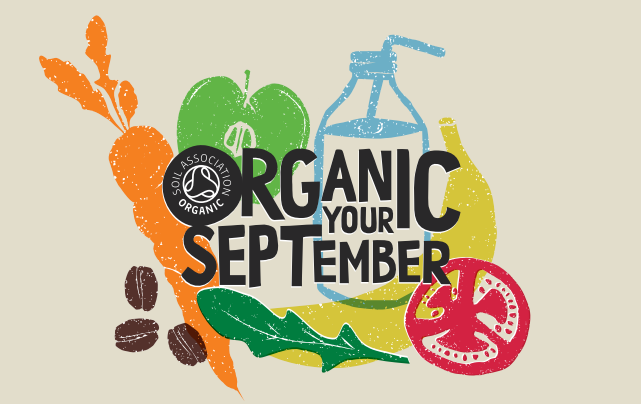 So this September, why not buy organic to support your health, sustainable farming practices and the environment.